Yes I'm a girly girl who loves her pink. Truthfully though I don't wear much of it - in fact these pants plus one casual tee basically sums up what I own for clothes in pink. Stationary on the other hand is a different story. 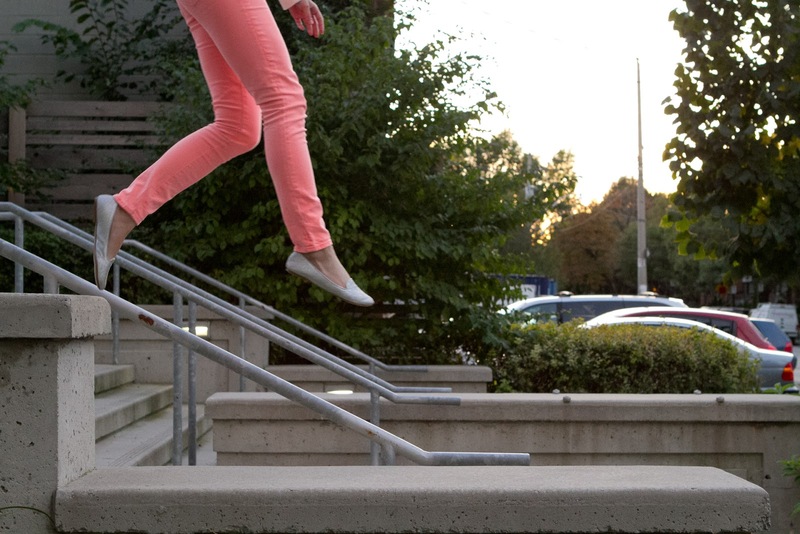 Anyway, this shoot was a lot of fun - I guess the pink pants got me feeling a little silly. I kept it fun with a sequinned tank then added one of my favourite blazers to give the option of dressing up the look a bit. It's sad to say it but I think this was the last wear for these pants this season. Sad yes, but when I unpack these again in the spring it's going to feel like Christmas. Have you done an official switch over in your closet of spring/summer clothes to fall/winter? I love the colour of the pants! The blazer is great too. Fun photo shoot! So gorgeous! great photos, i love the mixture of the cream/white top with those pants! Love the outfit! Amazing blazer and Your jeans are sweet! I also love your photos! I absolutely love this look Marla, you are such a beauty!! The pictures turned out amazing and every piece of your outfit is perfect with some of my favorite brands CM, BCBG & Jcrew! I haven't officially switched to Fall/Winter clothes even though I probably should get on that soon since the temperatures in TO are significantly cooler now! Is your Club Monaco tank from a recent purchase? Love it under a blazer. Super cute photos, I love your blazer! Stunning color combo. Love it! amazing outfit you are so gorg! love how you can always have fun too~~ xO! We just added you, followers number 384 (GFC). Amazing outfit and you look adorably pretty dear. I want your pants! :D:D The color is so cute! Great outfit! You're picture perfect in those pink pants...& that blazer is an eye catcher!! Fun pics btw!!! I thought you might like my blog too, so maybe we can follow eachother, if you like? That sparkle top is fabulous and I am in love with your pink pants! Such a girly and feminine look - I love it! !